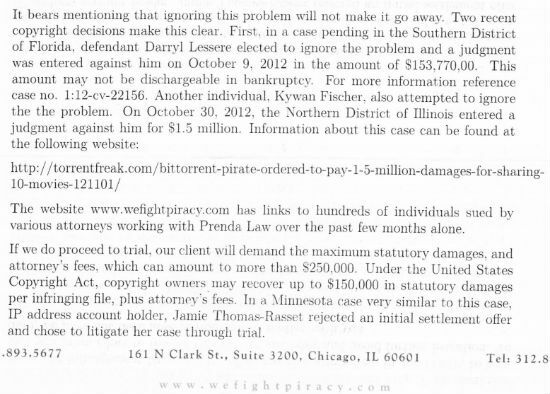 Prenda Law is one of the law firms involved in the ongoing mass-BitTorrent lawsuits in the US. TorrentFreak was informed that Prenda Law was using a recent article to threaten alleged BitTorrent downloaders. While TorrentFreak (TF) generally encourages people to promote their content, being used as a tool in extortion-type letters is not something they where happy with. As a solution they saw no other option but to “troll the copyright troll”. The image below is the letter Prenda law was sending out to alleged torrenters. Torrent freak redirected the said URL to a page with information about these mass-BitTorrent lawsuits. Rather than being scared away by an article about a $1.5 million judgment, Internet bill payers can inform themselves about the steps they can take to answer to the settlement letter. TF also included links to lawyers who are acquainted with these cases, plus links to additional useful resources.